A version of this review originally appeared here. 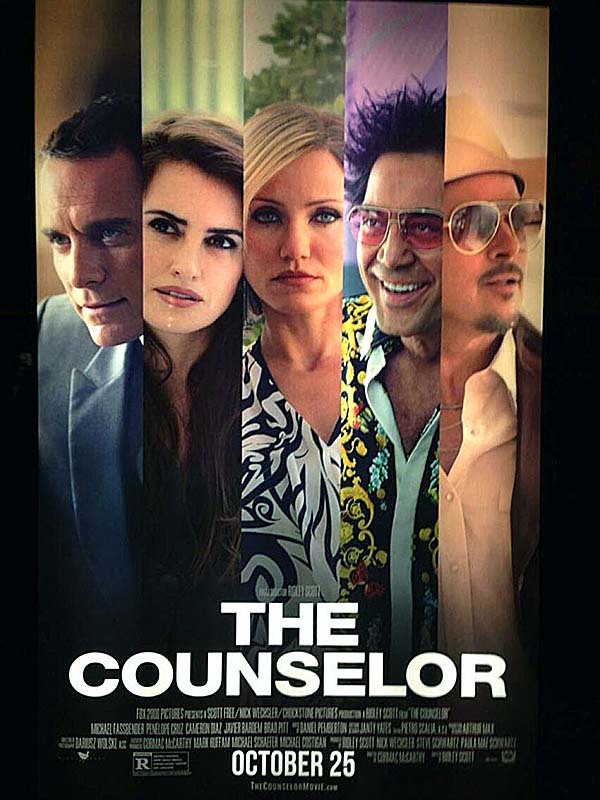 If each of the film’s conversations were climactic set pieces in another film, where the point was pontification, shock value, proclamatory delivery, really absolutely anything but chemistry, The Counselor could provide apexes for at least a dozen films. Instead, the film lines up several fantastic dramatic actors and Cameron Diaz, continually mix and match characters in two-person scenes, and then gradually steps up the intensity of silent, gore-laden intermissions. The details are attended to, as McCormac’s always are, but nothing is subtle; there are no fewer than three blatant, screaming motifs tying cheetahs and Malkina together. McCarthy (whose books are truly phenomenal) is a master at painting vistas with words and bringing together themes with word variations, but film is a visual medium. When we see Malkina and Reiner watching cheetahs hunt, when we see cheetah tattoos, and then cheetah stoles, and the animals play a part in later scenes, we do not need to hear Malkina pontificate about the joys of hunting, no matter how lush the verbiage. Even if it were delivered by an actress who could, well, deliver it. In addition, the film’s dialog would make great prose, but is difficult to land on film – perhaps it would work better on stage. Though Bardem, Pitt, and Fassbender (in order of aptitude – Fassbender can act, but he can’t always sell The Counselor’s word choices, nor his titular moniker) make the dialog work in several scenes, it simply can’t sustain the film. Plus, when hearing McCarthy’s words spoken as conversation rather than reading them, the viewer’s mind has time to calculate a response. Said calculation may not be as colorful as the actual film’s response, but in film, it’s often the gist which matters. The gist of the film is simple, but they attempt to convolute it with overblown symbolism and long-winded meetings. It does look good; in addition to its stars, The Counselor uses various vistas better than many blockbusters – for their colors and contrasts, not their landmarks – and creates lavish sets and costumes which add flair to the aforementioned pièce de résistances, which sole problem rests in their plurality. In the end, it’s more a morality tale in which there are no morals, full of verbosity and gore, signifying nothing.